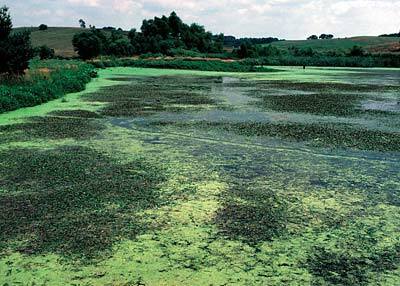 Excessive algae growth in this lake in Iowa is a result of eutrophication. Photo by Lynn Betts, USDA Natural Resources Conservation Service. Management of soil phosphorus (P) is important from both an environmental standpoint and for soil fertility. The low total P levels in soils and the small proportion of total P that is present in the available forms, may substantially limit plant growth. On the other hand, excessive application of P fertilizers has led to substantial losses of this element from soil, which can cause eutrophication in surface waters. In extreme cases of eutrophication, massive fish kills may occur due to anoxic conditions brought about by the decay of algae biomass stimulated by elevated inputs of P (and sometimes of N). Phosphorus is critical for plants because it is associated with the storage and transfer of energy. The energy obtained from photosynthesis and metabolism of carbohydrate is stored in the phosphate compounds ADP and ATP (adenosine di- and triphosphates). Synthesized through both respiration and photosynthesis, ATP contains high-energy phosphate groups that drive most energy-requiring biochemical processes. Phosphorus is also a component of DNA, RNA, and phospholipids. 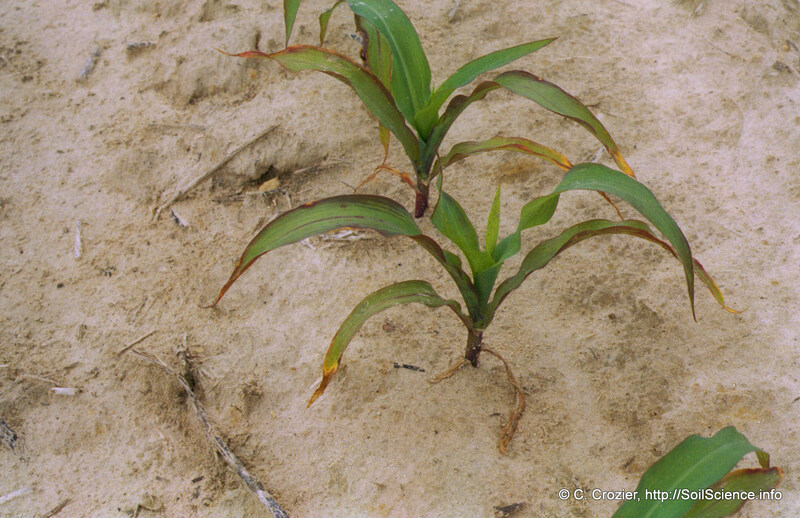 A phosphorus deficiency in corn grown in the Coastal Plain of North Carolina. Source. This work is licensed under a CC BY-NC-SA International License. Soluble P in the soil solution. These different forms of P vary in their availability to plants. Phosphorus is absorbed by plant roots from the soil solution as phosphate ions (H2PO4- and HPO42). See SoilWeb for more information on phosphorus cycling. Digestion using hydrofluoric acid (HF) will break down the silicate structures. Aqua Regia is another common acid digestion method. The solution is composed of concentrated nitric (HNO3) and hydrochloric acids (HCl). Digestion with concentrated hydrochloric acid (HCl). Phosphorus concentrations of digests can be determined by spectroscopic methods such as atomic absorption spectroscopy (AAS) and inductively coupled plasma optical emission spectroscopy (ICP-OES). The correlation of extracting solution with the plant availability of phosphorus varies for different soils and for different plant species. Available forms of phosphorus are determined by using one of the several extracting solutions. The extraction choice depends on soil properties, in particular the soil pH. Mechlich, which is a good general use extraction using a combination of two weak acids (0.05 M HCl + 0.025 M H2SO4). Sodium bicarbonate (NaHCO3), also known Olsen’s Method best suited for neutral to alkaline soils. Bray P-1 and P-2 (Bray P-1 is a weaker solution); appropriate for acid soils. Bray P-1 is a fluoride extraction method: Most soil phosphorus is found in combination with Al, Fe, and Ca. The F- ion can form complexes with Al3+ and Fe3+ ions in acid soils and consequently phosphorus held in the soil by these ions is released. Colorimetric analysis of extracts by flow injection analysis (FIA) can be done to determine phosphorus concentrations in extract solutions (as orthophosphate). Results are generally reported as ppm (i.e., μg/g soil). If any dilutions were necessary, remember to add those to the calculation. Chen, Ming, Lena Q. Ma. 2001. Comparison of three aqua regia digestion methods for twenty Florida soils. Soil Sci. Soc. Amer. J. 65:491-499. Fixen, P.E., and J.H. Grove. 1990. Testing soils for phosphorus. In Westerman, R.L. (ed). Soil Testing and Plant Analysis. 3rd edition. ASA-SSSA, Madison, WI. Hossner, L.R. 1996. Dissolution for total elemental analysis. In Sparks, D.L. (ed). Methods of Soil Analysis: chemical methods. Part 3. Soil Sci. Soc. Am. Book Series No. 5. ASA-SSSA, Madison, WI. Kuo, S. 1996. Phosphorus. In Sparks, D.L. (ed). Methods of Soil Analysis: chemical methods. Part 3. Soil Sci. Soc. Am. Book Series No. 5. ASA-SSSA, Madison, WI. O’Halloran, I.P., and B.J. Cade-Menum. 2008. Total and organic phosphorus. In Carter, M.R., and E.G. Gregorich (eds). Soil Sampling and Methods of Analysis. 2nd ed. Canadian Society of Soil Science, CRC Press and Taylor & Francis Group. Oxford, UK. Schoenau, J.J., and I.P. O’Halloran. 2008. Sodium bicarbonate-extractable phosphorus. In Carter, M.R., and E.G. Gregorich (eds). Soil Sampling and Methods of Analysis. 2nd ed. Canadian Society of Soil Science, CRC Press and Taylor & Francis Group. Oxford, UK. Sharpley, A.N., P.J.A. Kleinman, and J.L. Weld. 2008. Environmental soil phosphorus indices. In Carter, M.R., and E.G. Gregorich (eds). Soil Sampling and Methods of Analysis. 2nd ed. Canadian Society of Soil Science, CRC Press and Taylor & Francis Group. Oxford, UK. Soltanpour, P.V., G.W. Johnson, S.M. Workman, J.B. Jones, and R.O. Miller. 1996. Inductively coupled plasma emission spectrometry and inductively coupled plasma-mass spectroscopy. In Sparks, D.L. (ed). Methods of Soil Analysis: chemical methods. Part 3. Soil Sci. Soc. Am. Book Series No. 5. ASA-SSSA, Madison, WI. Ziadi, N., and Sen Tran, T. 2008. Mehlich 3-extractable phosphorus. In Carter, M.R., and E.G. Gregorich (eds). Soil Sampling and Methods of Analysis. 2nd ed. Canadian Society of Soil Science, CRC Press and Taylor & Francis Group. Oxford, UK.